The rainbow was born in the town of Chinchero, Peru, according to Incan mythology. Today, when the weavers of the area gather to dye wool in vats of boiling water, myth seems to become reality. The women wear bright red jackets as they tend to the vats, samples of already dyed wool are laid out -- from blue to saffron to purple -- and a weaver stirs a pot of deep moss-green wool with a long wooden pole. Chinchero is situated in the central Andes, a short distance from Cusco, on the way to the Inca Trail and Machu Picchu. It has developed into a tourist hub, although the community remains seemingly untouched by time. Quechua, the language of the Inca people, is spoken by many of the inhabitants, and the town still commands the vistas that long ago earned the region the moniker "the cloud kingdom of the Incas." "They have been there since 4:30 in the morning," explains Peggy Clark, director of the Alliance for Artisan Enterprise, a group that supports the global handicraft market, including the weavers of this region. "It is physically difficult, labor-intensive work, a community effort -- but really peaceful. Time slows down over this whole day. It's an all-hands-on-deck kind of thing." Until recently, many of the ancient weaving customs of Chinchero, which are rooted in the stunning biodiversity of the area -- from natural dyeing to harvesting alpaca wool -- had all but disappeared for decades, during which chemical dyes and machine weaving pushed out the old techniques. Now, however, natural dyeing and traditional weaving methods can take some of the credit for having brought an economic, environmental, and social renewal to the region. The textiles produced in Chinchero are sold globally and are on display in museums around the world, and that's partly thanks to one woman, Nilda Callañaupa. Forty years ago, Chinchero was home to a young girl, whose job it was to tend sheep as they grazed. As the many hours of the day passed on the hillside, she spun wool as she watched her animal charges, as girls her age were expected to do, producing usable skeins of wool. The wool was used to make the textiles that were an important part of the community -- as blankets, clothing, in farming, and in sacred rituals. And as the girl spun, she became entranced with the act -- so much so that she found herself dreaming of spinning as she slept each night. "I am proud that I learned skills and knowledge from my Chincero grandmothers and their ability to lay out and weave complex designs, carrying on ideas passed from their mothers and grandmothers," says Callañaupa, now 54 and founder director of the CTTC. " ... I saw how my grandmothers took strength from their Inca rituals and ceremonies, especially those connected with weaving and spinning." "The textile process was poorly managed," says Callañaupa. "The younger generation was not working with the same attention to quality as the elders." The growing tourist market had created a demand for simple, quickly produced designs and products of lesser quality: belts, bags, friendship bracelets from exotic, "foreign" lands. 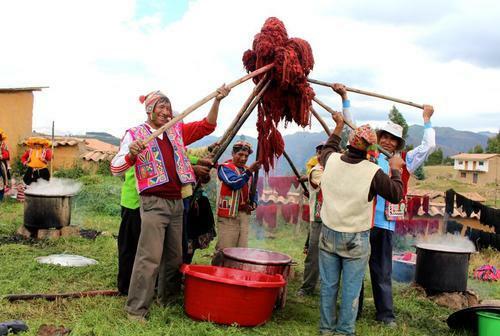 Commercially produced synthetic dyes were bright, cheap, and easy to use (natural dyeing is a much longer, more expensive process), and the weavers in Chincero were rapidly abandoning the traditional methods. Beyond the degradation of quality that such developments implied, Callañaupa saw the loss of the connection between nature and culture looming. The ecosystem management systems that went along with the old methods (sustainable use of plants, animals, water, and land), developed over thousands of years, were becoming lost -- and the ecosystem was suffering. It's a phenomenon that occurs far beyond Chinchero, in fact. As Greenpeace reported, the textile industry's impact on the environment in terms of water and land use, energy efficiency, waste production, chemical use, and greenhouse-gas emissions is alarming. Groups like SlowColor are trying to tackle this problem, as their website explains. "SlowColor rejuvenates centuries-old fabric dyeing techniques and handlooming traditions, protects the environment and creates fabrics that are healthy for life. SlowColor connects artisan to audience, tradition to global market." And in the highlands of Peru, these are precisely the methods advocated by Callañaupa and the CTTC. 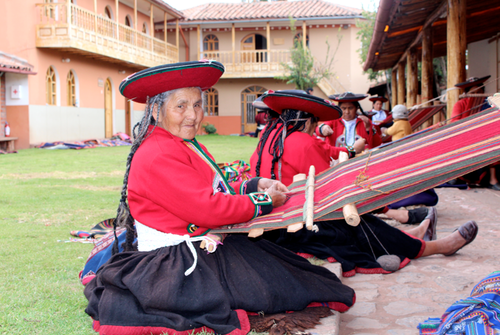 As a teenager, Callañaupa became close friends with an older woman of the community, who taught her how to weave in the traditional ways. Callañaupa's love of learning led her to become the first in her community to go to university, then on to study in the United States at Berkeley -- and she took her spindle with her. It was a calling that led Callañaupa to establish the CTTC in 1996. In addition to holding periodic dyeing workshops for weavers in the region, the Center runs programs for youth and elders. "Not only do I hope that young people will continue their traditions but I would like to see Inca children today experiencing the joy, sense of identity and accomplishment that spinning and weaving can bring to their lives," says Callañaupa. In a relatively short span of time, this community, in which it seemed that the ancient ways would be lost forever, has reclaimed its roots -- and the change has gone beyond the weaving. When you walk through Chinchero, perhaps through the Sunday market where many textiles are sold, many of the townspeople are dressed in traditional garb; as recently as 10 years ago, this wasn't the case. It was Callañaupa and others in her community who encouraged the community to begin dressing as their ancestors had, as a way of strengthening their connection to the old ways -- to strong criticism at first. It seemed, Callañaupa explains her book Textile Traditions of Chincero, "that what I was doing seemed to be going backwards in our history because traditional clothes were used by women without education, and educated people should change. Many women and girls received strong criticism, but we have already overcome that complex phase of unwarranted embarrassment." It has been, in fact, by "going backwards" that Chinchero has not only survived but thrived. The old weaving techniques, once scorned, now have great value. More young people are staying in Chincero and making a living from weaving, as opposed to going to the cities and facing an uncertain and potentially dangerous future. Women are now economically empowered, which has a net positive effect on their families and the community as a whole. "We Are Helping the Land"
Although preservation of their ecosystem is not the main objective of the Center, their work has had a positive impact on the land in any case. "By giving opportunity to the weavers," Callañaupa says, "that creates income for families, so they don't need to overwork the land for income [from agriculture] ... we like alpaca wool, so we are raising more. When they graze in the open air, they fertilize the land. In some small scale, we are helping the land." Water use is an important part of the picture, too. Any dyeing process -- whether it's with synthetic or natural dyes -- uses large amounts of water, so to be environmentally responsible, there has to be some awareness of where the water comes from. The region of the CTTC is part of an innovative watershed services project that is protecting Lake Piuray, a major source of water for Cusco and Chinchero. This project is backed by the national water regulator, SUNASS, and executed with the funds of water users, via the Cusco water company (SEDACUSCO). Such a collaboration is unique, and has generated enthusiasm among the various actors and the desire to replicate these kinds of win-win projects throughout Peru. And after the dyeing process, there is the matter of the waste water. As SlowColor's Tricia O'Keefe says about chemical dye use, "What happens to the after you're done dyeing? Where are those chemicals going? That is a huge issue ... the thing about the natural dyes is that you could completely recycle that water." In using natural dyes over synthetic, Callañaupa and her weavers are ensuring that toxic chemicals are not released into the environment via the run-off water. Callañaupa's work -- which preserves and respects the ecosystem in which it exists -- means that the ancient ways can work; in fact, they may do the best job at strengthening communities and improving livelihoods. This is vital, says O'Keefe. There is a trend of "migration from rural to urban, and then into urban poverty, because what skills do they really have once they get [to the cities]? ... What's happening to the land they're abandoning?" Opportunities offered by the CTTC offer a positive scenario both the region's people and the land. "It's great in Peru that this is happening," says O'Keefe. "It gives people at least a choice ... If you want to stay in your rural village where you grew up, you actually have something sustainable to do that. If you want to go study computers in the city, you can do that. There are choices." As the Alliance for Artisan Enterprise's Peggy Clark describes the reasoning behind her group's support of Callañaupa, "One of the things that people think is that environment is separate from economy, so there's not enough support and investment to move the needle and make a difference. The only way to do that is to broaden the tent. "Not only does [the work of the CTTC] make sense at a policy level or an investment level, it makes sense at an individual level. Like with Nilda and her family: they are preserving the natural environment as well as finding ways to create products from their environment for their livelihoods. They can send their kids to school, they can support their families." Later this year, world leaders will gather in Paris for the next COP to find solutions for dealing with climate change. They will come by airplane and limousine, and they will fill the finest hotels. While they negotiate and debate, in a "cloud kingdom" across the world, a group of weavers, led by one woman, will be doing what their ancestors did for centuries, weaving stories of sustainability and solution, using the astonishing biodiversity of the region responsibly and with great success. As Callañaupa says, "It is becoming clear that the survival of diversity contributes to the valuable storehouse of world resources." "Artisans are often the stewards of the natural world," says Clark. "Often in traditional ways ... they are working in their communities with products that are from their environment, be it fibers from leaves, bark from trees, or natural dyes from difference sources. So they are invested in ensuring that those resources will always be there." In the introduction to one of Callañaupa's books, Weaving in the Peruvian Highlands, anthropologist, ethnobotanist, author, and photographer Wade Davis writes: "These textiles are sacred cloth, woven from the threads of memory by Andean hands that are at last firmly in control of their destiny. Each tells a story, and each story is a prayer for the well-being of the people, the land, and the community." Callañaupa's work means that we can produce goods that have global value in a way that doesn't ruin the soil or deplete the water table or poison the air. We can engage the youth in our communities in healthy, life-affirming activity, and we can reward their efforts with a sustainable livelihood. And while the leaders convene at COP, Callañaupa and her weavers will be creating art -- each piece a "story" -- that preserves and promotes the biodiversity that sustains us all, one thread at a time.